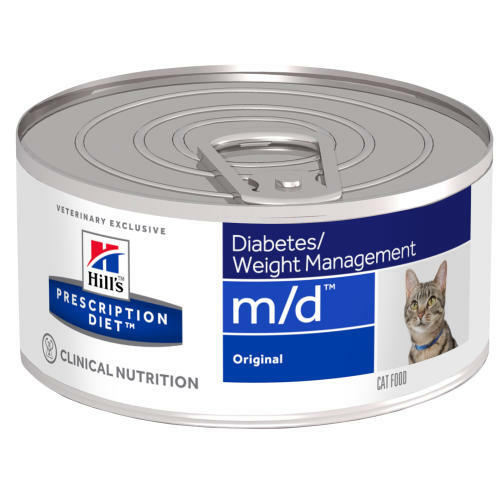 MD Feline is a great nutritional management option for feline patients who are overweight or suffer from diabetes. Minced with Liver: Pork, pork liver (30%), maize starch, cellulose, soy protein, animal fat, minerals, vitamins, rice flour,taurine, DL-methionine, trace elements and L-carnitine. Beta-carotene 0.4 mg/kg, Calcium 0.0021, Carbohydrate (NFE) 0.039, Fat 0.048, Fibre (crude) 0.015, L-Carnitine 130 mg/kg, Magnesium 0.00016, Moisture 0.752, Omega-3 fatty acids 0.0007, Omega-6 fatty acids 0.0073, Phosphorus 0.0017, Potassium 0.0019, Protein 0.131, Sodium 0.0009, Starch 0.025, Taurine 900 mg/kg, Total sugar 0 < 0.5%, Vitamin A 48893 IU/kg, Vitamin C 17 mg/kg, Vitamin D 370 IU/kg, Vitamin E 150 mg/kg.